This entry was posted in Entree, Pork and tagged baked, Braise, Braised, browned, comfort, Country, Easy, food, Garlic, oven, Pork, recipe, Ribs, rosemary, sauce, seared, Slow, Style, white, Wine. Bookmark the permalink. These ribs come out beautifully and the recipe is so simple and easy to make. Cooking in the oven at a low temp certainly helps to make these ribs fall of the bone (if you’re using bone-in). Making these now for a dinner party. =) Thanks for the recipe! Neither my husband nor I like BBQ ribs all that much so I was searching for an alternative. I must have searched a hundred recipes and all of them contained ingredients we either don’t like or can’t eat — until I found yours. Not only did I have all ingredients on-hand but we grow Rosemary in our yard because my husband loves it and your recipe is perfect for his Father’s Day dinner. I will be using a heavy skillet and will utilize your tip about the foil mentioned above. I’ll pair the ribs with couscous prepared in chicken broth and fresh salad with chocolate dipped strawberries for the finale. Thank you for this yummy option. These were very easy to make and TASTY! A nice change from the typical bbq recipes you find for them. I will make them again! Can’t wait to eat! Entire loft smells of lavender & garlic…mmm mmmmmm! Following to a T, at I am. 😂I’m probably going to serve w the rice & veggies also…that’s what I’ve got….🙋🏼Sweet! And Thank You!! Yes….just as I suspected…it. WasFantastic!! Thanks s much for that recipe!! This is the second time I’m making. It was a hit with my family. Tender and flavorful. Love braising! This was great a dish. I followed the recipe with the exception of substituting herbs de Provence for the rosemary, adding extra garlic and omitting the salt. I’m on a very low sodium diet due to kidney issues and I like that this recipe is really flavorful even with no salt. I used a Calphalon skillet covered with foil and the pork came out very tender. I served it with riced cauliflower and cubed eggplant which I tossed in EEVO and pepper and roasted for 15 minutes in a 400 oven. The cauliflower & eggplant soaked up the sauce really well. Just delicious, thank you. I’m going to try this one today and will let you know. This was delicious! Thank you for giving me a pork recipe that I can’t turn into shoe leather!!! This was amazingly delicious! Easy tasty and huge hit!! The Rosemary adds just the right amount if mmmmmmmmmmmmmmmm! I doubled the garlic and added a pat of butter – but I also made about double the amount – i used boneless country style ribs, dutch oven and added about 35 minutes of cooking time. Falling apart tender and so flavorful i found myself closing my eyes with each bite. Thank you Randy! Thank you Laurie! This is one of my long time favorites…I’m so glad you enjoyed it! Now it is one of my favorite dishes with a very small amendment /addition. I added crashed chillies. Yamy Thanks for sharing. These were great. 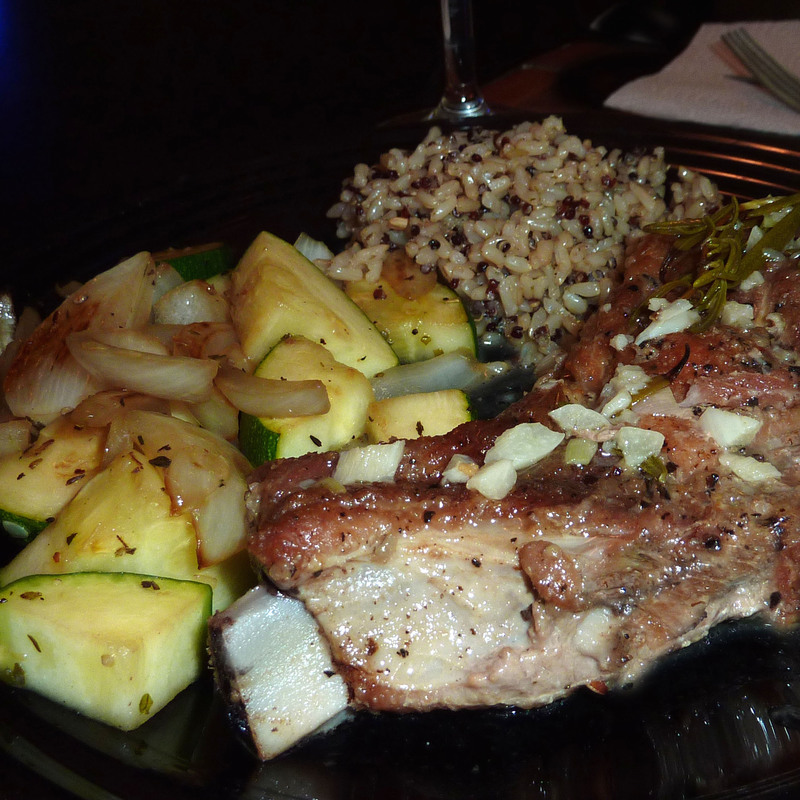 I was looking for an alternative to bbq for country style pork ribs, and I will definitely make this again. I followed the recipe above (except with dried herbs de provence instead of fresh rosemary) and left them in the oven for 90 minutes in a Calphalon skillet that I had covered with foil before putting the lid on it. After 90 minutes, the pan sauce was a light straw color and tasted rich and delicious. I was in no hurry and thought the pork might get more tender if I went a little longer, so back in it went — but this time without the foil, just the Calphalon skillet’s lid. Apparently, the lid’s not as tight-fitting as I thought, because after a half hour the sauce had reduced and turned into a dark brown glaze. It was still very tasty, just not quite what I had thought I was getting! The lesson: if you don’t own a Dutch oven and try this in an oven-proof pan, use foil! I am so glad you found and enjoyed my recipe! 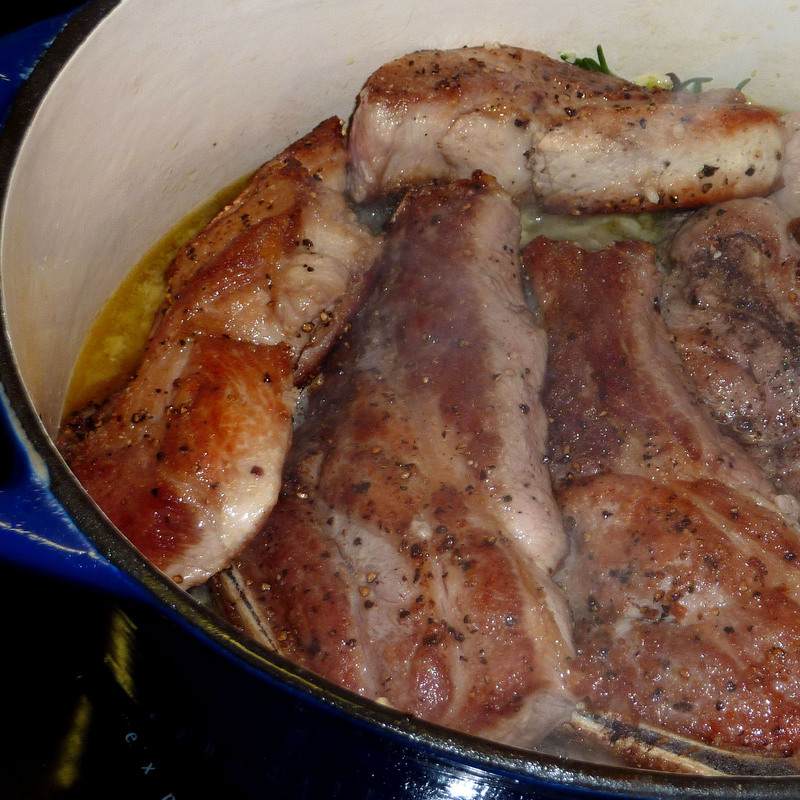 I was hesitant to cook the pork much longer as I was looking for the sweet spot when the meat was at it’s most tender. Thanks for driving home the point about the foil…it really does make a difference when braising. This looks amazing. I am going to try this one for sure! They look like they came out so juicy!